It didn’t just rain, it absolutely poured. 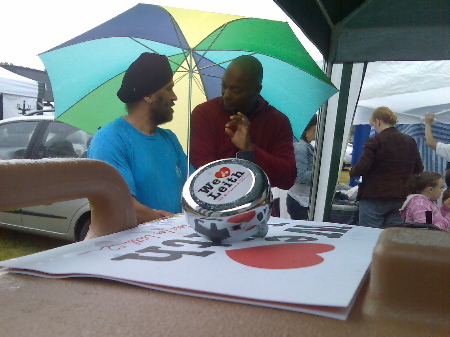 Recipes and posters got washed away as the deluge battered our poor gazebos. But cooks just kept on cooking which was just as well because as soon as the rain stopped people came looking for food. Crowds of them. 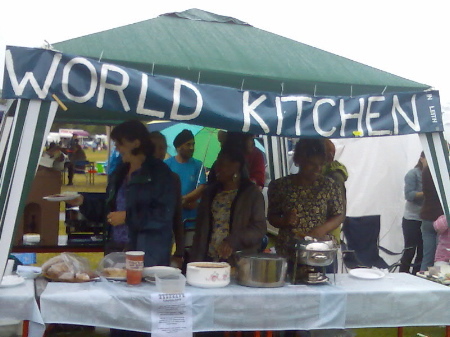 We might have hoped for better weather but we couldn’t have asked for a better beginning for the World Kitchen than the Gala Day in Leith Links on Saturday (13 June). 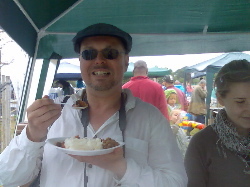 The aim was to bring people together to enjoy eating food from different cultural traditions of the world. To break down some of the barriers daily life seems to set up. And it worked better than we ever dared to imagine. “This is good,” said Luis with a broad smile on his face as the rain leaked in all around us. He had been just about to start his cookery demonstration when the sky opened. “We can improvise,” he said, setting out a dish of Portuguese food: prawn and coriander ‘pancakes’ made with chickpea flour and served on crisp lettuce topped with a delicate tomato salsa flavoured with lemon grass. Cookery demonstrations were abandoned but there was still plenty to see. On the stall there was Maryjannas delicious sour apple cake from Poland (donated by the Kleofas Cafe), a basket of perfect Pakistani mangoes (thanks to Planet Asia), loaves of wonderful Irish soda bread (baked by Celia to Granny Barron’s recipe), and Fran’s tray of American choc chip cookies which stayed miraculously crisp despite the rain. Then there was the hot stuff. 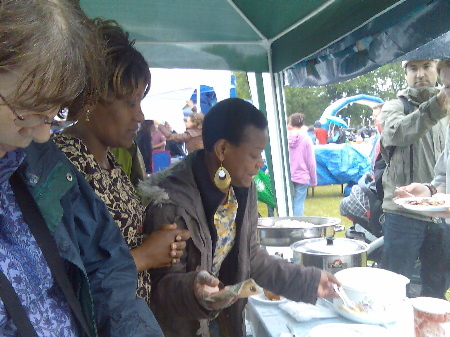 A big pot of chilli pepper soup (a Nigerian recipe made by Patricia) began to draw hungry folk around noon. Agnes (from the Africa Centre) arrived with trays of African maize porridge, chicken, beans and spinach cooked with peanuts. Mridu served up courgettes stunningly crimson in tandoori masala sauce and a chutney made with pineapples and almonds which went amazingly well with my Scottish potato scones (just as Mridu had promised). Not dreaming: these are definitely real life pakoras! 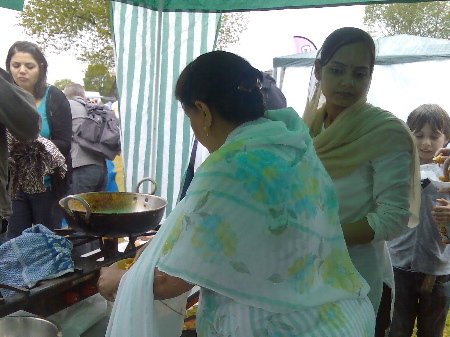 And all the time Pip was conjuring up home-made pakoras at the other end of the stall along with her daughter-in-law Balvinder (pictured above), “I was dreaming about pakoras in the night,” she says laughing at the end of a very long but successful day over a hot stove. I wasn’t sure if it would work.” In fact it worked so well Pip was kept busy right until the last drop of onion, potato and batter. (Fortunately we had brought an extra bottle of gas to fire the heroic old burners kindly provided by the Scouts). And still people kept coming back for more. Just when we thought we had run out Alice arrived with a new pot of beans and coconut and reinforcements of maize meal. Meanwhile, we began to invent combinations of food we had never thought of before. Not just Scots potato scones with Indian chutney, but Irish soda bread with African beans, and Portuguese prawn and coriander with Indian pakoras. And…”just give me a taste of everything you have got,” said one happy customer loading his plate. That’s it for now. But we will be back. The World Kitchen has loads more stories to tell about our sponsors, the people who made the food and the places it came from. And more events to plan. Thank you, thank you to all our friends and supporters. And special congratulations to Gurmit and Mridu who had the brilliant idea of creating a World Kitchen just a few months ago! 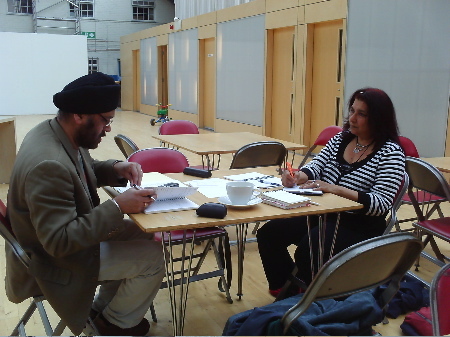 Flashback to April: Gurmit and Mridu making plans at Out of the Blue. Oh, I feel like such an idiot for having missed it. I shall have to make my own world kitche at home. Great photos! Pots, pans, steam, action!